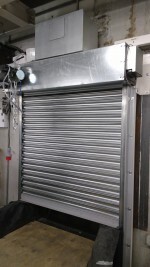 HART DOOR SYSTEMS says its shutter (pictured) delivers 60-minute fire resistance to match the requirements of a major London airport. Hart says its shutters deliver from 30 minutes to 4 hours fire resistance subject to customer requirements, building regulations and insurance requirements and the British Research Establishment LPCB department has tested, assessed, certified and monitored its range of fire roller shutters which can be manufactured up to 10m wide and 7m high. ISO 9001 certification ensures production and installation are completed to all relevant standards. 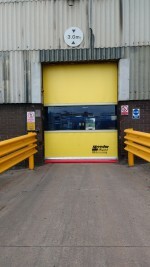 HART DOOR SYSTEMS says its flagship Speedor Super high speed door (pictured), has been in continuous production since 1983 and many thousands of doors have been installed on challenging sites across the world.